Our target customer is a small to medium business (SMB) in the United Kingdom and Estonia whose customers are larger companies that demand long payment terms. We offer SMBs invoice discounting, which means that investors purchase the invoice for a small discount. The SMB can then put the cash back to work to service new customers, purchase inventory or pay workers. On the due date, the company that purchased the goods or services makes a payment to Investly’s bank account in the full amount of the invoice. The discount covers investors’ return and Investly's fee. Without invoice discounting, SMBs would have to wait weeks or even months for payment and would have to turn down new business while waiting. Once you've completed your account setup, you can start investing. Here are the basics. Investors' bids are sorted from lowest to the highest interest rate. Investors can make bids as long as the auction is open (please refer to the timer on the auction page). When making a bid, you are asked to enter the amount and interest rate. The final rate is determined by the bid that filled the financing target. Please see this article for additional information. 2. What does APR stand for? APR stands for annual percentage rate, it is the annual interest rate for the invoice. Interest rates are displayed on an annual basis regardless of the advance duration. Please see this article for details. 3. Is it possible to automate investing? Yes, you can use the automatic bidder. Please see the article for details. 4. What does the credit rating mean? Or the PD%? Both measure risk. For a detailed description of both, please read this article. 5. What happens in case of debtor insolvency? In case of debtor insolvency, we can ask for payment from the company that sold the invoice. More information is available in this article. We kindly ask companies to present articles of association, an ID copy and address proof for the representative and all shareholders/directors owning more than 25% of shares. To complete the signup process, the first deposit has to come from the company's bank account. Once we've confirmed the bank account, deposits can be sent via Transferwise and Currencyfair. What is the minimum investment per invoice? The minimum bid per invoice is £10 in the UK and €10 in Estonia. Why are interest rates displayed on an annual basis? For investors, interest rates are displayed on an annual basis regardless of the duration of the invoices. A 30-day invoice with an interest rate of 15% pays out 30/365*15 = 1.23% per 30 days. If you keep your money invested for the whole year, investing in 30-day invoices at a 15% annual rate, your annual return will be 15%. The annual rate makes it easier to compare invoice finance with alternative assets (stocks, other P2P loans, bonds etc.). How is the auction closing rate determined? Investly uses reverse auctions where investors compete based on the interest rate. The final rate is determined in an auction. Investly sets the starting rate based on our credit analysis. During the auction, investors made bids, which are sorted based on the interest rate (from smallest to largest). Bids with matching rates are sorted based on time (earlier bids first). The final rate is based on the bid that filled the financing target. All investors earn a return based on the interest rate of the last competing bid (see the image below). The minimal rate for any auction is 8%. Example: The financing target for this auction was £10,489. The bids with the lowest interest rate are counted first. The first 16 bids are enough to reach the financing target (see the third column titled "filled"). The final interest rate is set by the bid that filled the financing target. In this case, the interest rate for all investors participating is 15%. The last bid did not compete. Investors can make bids to an auction as long as the auction is open (refer to the countdown timer). 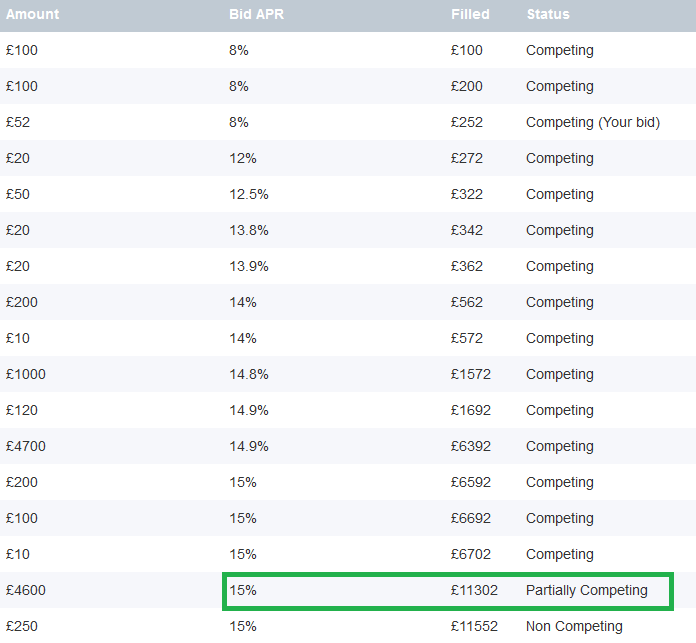 If an invoice auction shows 100% fill, it means you can still make a bid, but you will have to offer a lower interest rate for your bid to compete. How to open a UK account? 1. Go to the investing page, click on the UK and accept the UK terms. 2. Add address proof (required by law when investing in the UK). 4. Make a test deposit to confirm your bank account. Because Investly doesn't offer currency exchange services, we ask you to make deposits in pounds or euros depending on which invoices you would like to invest in. If you don't have a bank account in pounds, you can make deposits using Transferwise. However, the first deposit has to come from your bank account (not Transferwise). The first deposit can be as small as 1 pence as it is only used to confirm your bank account (this is due to regulations regarding money laundering). If you transfer euros or any other currency besides pounds to our UK investor account then our bank will charge fees for the conversion (see this article for details). Once your bank account has been confirmed, you are free to use Transferwise for deposits. We can also make withdrawals to your account using Transferwise. *We accept deposits done using third-party payment providers (Transferwise, Paysera, Pocopay, Currencyfair etc.) after we've been able to confirm your bank account. Withdrawals can only be made to your bank account, either directly or using a third party provider (Investy -> Transferwise -> your bank account). We cannot make a payment to a third party account (Investly -> Transferwise -> your Paysera account). 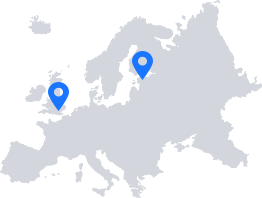 How to open an Estonian account? Because Investly doesn't offer currency exchange services, we ask you to make deposits in pounds or euros depending on which invoices you would like to invest in. If you don't have a bank account in euros, you can make deposits using Transferwise. However, the first deposit has to come from your bank account (not Transferwise). The first deposit can be as small as 1 cent as it is only used to confirm your bank account (this is due to regulations regarding money laundering). If you transfer pounds or any other currency besides euros to our Estonian investor account then our bank will charge fees for the conversion (see this article for details). When does Investly launch auctions? Auctions are launched as soon as we have confirmation from the debtor (confirming that they've received the goods). We don't have a preset time of day for when auctions are launched. Most invoices are sold within seconds of being launched due to the number of investors using the autobidder. If the autobidder doesn't fill the funding target, then we send out an e-mail to investors notifying them of the investment opportunity. What information is used to make a credit decision? Investly only accepts invoices that have been issued to businesses that have a history of trading for at least five years, annual turnover of at least £1 million and a good credit standing (at least three years, annual turnover of €500,000 and a good credit standing in Estonia). We run background checks for the seller company’s directors and stakeholders, we also make sure the seller company has a good credit standing.To get a better grip on the company’s health, we ask for the bank statements of all of their account for the previous 6 months. Bank statements offer a very intimate look at company’s financials and they are more up to date than annual statements. Bank statements and other sensitive information is not shared with third parties. Receiving confirmation lowers is important as it lowers the risk of disputes. The seller will only receive money once we've received confirmation from the debtor. What if the invoice is not paid in time? The invoice seller has an obligation to pay penalties if the invoice is overdue for more than three days. The penalties are transferred to investors' accounts only after the invoice seller has made the transfer. Investly does not pay out penalties out of its own pocket. If payment is received up to three days after the due date, penalties will not apply. The penalty interest rate equals the rate that was set at the end of the auction. If and when an invoice is overdue, Investly will contact the counterparty to ask for an update. If payment is not received within 30 days, recourse will be applied. This means the seller company will have to repurchase the invoice (including interest and penalties). Please see this article for details. If the invoice is paid early, investors get to keep the extra interest. What are the most common reasons for late payment? Once an invoice is sold, the funds are transferred to the invoice seller. They use the cash to start new projects, pay rent, wages and taxes. On the due date, the buyer will have to transfer the funds to Investly. Most buyers pay invoices on time. Some invoices are paid before the due date and some just a few days after the due date. To accommodate national holidays, bank transfer times and other technicalities, no penalties for overdue time are collected for the first three days. However, if an invoice is paid more than three days late, penalties are collected for the full overdue period. It is common practice for companies not to demand penalties from each other during the first two to four weeks. Our approach is a compromise between generally accepted business culture and investor expectations. There are lots of factors that can contribute to a payment being late. We spend a lot of time making sure everything is in place to ensure timely payment to the correct account. When a payment is late, we have a process in place to ensure funds are collected in the full amount as soon as possible. The payment culture varies between countries depending on the cultural norms, the size of the buyer and adoption of modern technology. These are external factors that in most cases, we do not have control over. Nonetheless, having a better understanding of the reasons for late payment goes a long way in understanding invoice finance better. Buyer has outsourced their accounting - due to cost-cutting and specialisation, more and more companies are buying accounting as a service. This can cause delays in contacting the person responsible for the transaction, especially in large organisations. A buyer makes transfers on certain weekdays or weeks only - in some companies, accountants make payments once a week or once every two weeks. This is largely based on overall business culture and internal procedures in certain companies. The larger the company, the more they are set in their ways. In case payments arrive late on a constant basis, we lengthen the invoice financing period for all future invoices so that the seller pays more and investors see a more accurate financing period. The buyer’s representative confirms the invoice but forgets to inform the accounting department. Accountants are relatively conservative people and if they have doubts about any changes made to the payment details, they will usually hold the payment until they have been able to clarify the issue with their employer. It also happens that the buyer’s representative or accountant is on vacation or sick leave on the due date. Buyer is always late - it is their policy not to pay on time. Some companies use their suppliers as providers of cost-free working capital by delaying payment. This unethical behaviour is tolerated due to the overwhelming market power of these large buyers - they can choose to and do drop suppliers that are not satisfied with their terms. In case payments arrive late on a constant basis, we lengthen the invoice financing period for all future invoices so that the seller pays more and investors see a more accurate financing period. Buyer is waiting for payment from their contractual partner - companies that are working on large projects usually work for a large main contractor, who is in charge of project management. In some cases, there are several layers of contractors, especially when specialist work is required. When payment for the project is contingent on the whole project moving forward, a delay in the work of a third party that is unrelated to the invoice seller can cause a delay in payment. The buyer simply forgets - sometimes people simply forget to make the payment on the correct date. Investly sends out automatic reminders every time an invoice is overdue. The buyer made the payment to the seller, not Investly - although this is rather uncommon, it happens mostly with new customers. The reason is really simple - the buyer company’s accountant has overlooked the payment details. All buyers are notified of payment details and accountants have to make note of that. The same can happen with invoices that have not been financed with us, in which case we will transfer the funds to the correct receiver after having received the necessary documents. Most of these cases are resolved within a reasonable amount of time. Cultural differences do play a role and hence we see a difference in payment habits between the UK and Estonia. We constantly monitor the payment habits of business partners and take necessary measures to ensure payment. Investly sends out automatic reminders to the seller and buyer in case the invoice is not paid on time. In some cases we have to follow-up with phone calls. Most of the time this helps solve the issue. After 30 days have passed from the invoice due date, Investly has the right to ask the invoice seller to repurchase the invoice. In case the seller and buyer are willing to cooperate, Investly is willing to consider alternatives, such as agreeing on a payment schedule, to settle the debt. However, if there is no progress, we do not hesitate to ask the seller to repurchase the invoice. In case a payment is late more than 45 days, a company can publish a payment default notification that is visible to the public. This can be issued against the buyer 45 days after the due date and the seller 45 days after the recourse date. A publicly visible payment default notice is a signal to all business partners that the company has financial difficulties. In a number of cases the threat of publicising the debt has helped us collect the debt faster. A solution that is midway between an agreement and court proceedings is signing a payment schedule at the notary’s office. The advantage of such a deal is that upon failure to adhere to the schedule, Investly can turn to the bailiff to demand immediate enforcement of the contract (ie. the debt has to be paid in full without additional court proceedings). A judge is likely to ask parties to reach an agreement, this means signing a payment schedule that does not involve court proceedings is actually a preferred solution, saving investors time and money. If the parties don’t show willingness to cooperate Investly can and will start court proceedings to collect the debt. This is the most time-consuming and most expensive form of collecting debts. Whenever possible, Investly tries to find a faster and cheaper solution for the benefit of investors. Enforcement of personal guarantees also has to be done through the courts. Cases that end up in court have an unpredictable timeline of resolution because the defendants and accusers have the right to appeal a decision. In the United Kingdom court proceedings against the company and the individual are taken by a collection agency. Most cases that are overdue more than 60 days are handed over to a collection agency. However, is the seller and/or debtor cooperate with Investly, the case will be handled in-house. What happens in case of debtor insolvency? In the case of debtor insolvency, we ask the seller for recourse - this means the seller of the invoice has to repurchase the invoice in full (principal + interest + any overdue fees). As a final guarantee, we have a personal guaranty from the seller company's director. What information do investors see? We run credit checks, background checks and fraud checks to determine the creditworthiness of all companies selling invoices. To help investors make an educated decision, we share the summary of our findings gathered from public databases (see below). Investors can also see information on the previous invoice you have sold on the platform. We do not share private information. A short description of the seller and debtor company is provided in emails sent out to all investors. In the future, this information will be displayed on the website. The probability of default (PD%) shows the likelihood of the company falling into arrears within the following 12 months. at 12% or more it is considered high risk. How do I automate investing in invoices? A lot of investors don’t want to log in each time there is an invoice on sale. To automate investing, you can use the autobidder (BETA). To activate the automatic bidder you first have to enter the amount you’d like to invest and the minimum annual interest rate you’re willing to accept. After turning it on you’re set to go. The autobidder places a single bid on every new invoice. The bid will be made in the amount and at the rate you chose. When you set you minimum rate at 13% and the auction starts at 15%, the bidder will place a bid at 13%. If the auction starts at 12% and you set your rate at 13%, the autobidder will not make a bid. The autobidder will keep making bids while you have a balance remaining in your account. If your balance is below your selected bid, the bid will equal the amount remaining in your account. Example: if your autobidder is set to make a £/€ 200 investment, but you account only has 150 of funds available, the bidder will bid 150. The bidder will only make bids to new invoices. You can turn the autobidder on and off by toggling the button on top of the autobidder page. The autobidder will make bids in both currencies if you are active in both countries and have sufficient funds in your account. You can use the autobidder in combination with manual investing. For example, you can set the autobidder to bid 50 euros/pounds on each invoice. You can then increase your bid manually. This flexible approach allows you to increase your bids on invoices that best fit your criteria. My bid wasn't accepted, what happened? If the total sum of bids is larger than the funding target for the auction, some bids are left out. The investors whose bids were left out go to the top of the queue for the next invoice that is sold. This means all investors using the autobidder have an equal chance of their funds being invested. Investly does not charge investors. We charge invoice sellers, but we do not take fees upfront. We get paid when the invoice is repaid. This helps align our interests with investors. Can I sell my invoices to another investor? Investments in invoices are very short-term in nature - the average duration is just 30-40 days. Because of the short duration, there is no need for a secondary market. Investly offers investors access to the UK and Estonian invoices. Because Investly doesn't offer currency exchange services, investors will need to deposit funds in the right currency. Pound deposits/withdrawals to a pound account are free of charge, the same applies to euro deposits/withdrawals. *There may be extra charges levied by the intermediary and/or destination bank. Santander has no control over these charges. The exchange rates that they apply to foreign currency payments are based on market conditions. **Please see the pricing page on Transferwise's home page for details. The fee will be passed on to the investor without any additional charges from Investly. How do I choose a display name? Each investor can choose a username that is displayed on the auction page. To change your username, go to your user profile, then click on the 'change' button. Update your username and click 'save'. How long does it take to deposit funds? Depositing from the UK to our pound account arrive within one business day. International payments can take up to five business days. In the UK we bank with Barclays. Deposits from Estonia to our euro account arrive within one business day. Payments from within the euro area take up to two business days. International payments can take up to five business days. In Estonia, we bank with LHV. How to change my existing bank account in Investly? In order to change your bank account, please make a control payment from your new bank account with a description 'user ID, control payment'. You can find your user ID when clicking green "Deposit" button on your investor account. User ID is a 8 digit code and marked as payment description in that view. Your account number will be changed when we have received the payment. You will receive a notification once your deposit has been confirmed. How quickly can I withdraw my money? There is no notice period - you can withdraw your funds at any time. Because the average duration is around 30 days, you can unwind your portfolio very fast. Please remember that the bank transfer might take a bit of time. Transfers within the same country (UK, Estonia) clear within a day or two, transfers between countries could take up to three business days. Where do I find income data for the tax authority? Choose start and end date. Choose interest, penalties and referral fee from the dropdown list (for Estonian private individuals, taxes on referral fees have already been paid and this does not have to be declared again). Click on the filter button (hidden on the below image, but just below the transaction type dropdown list) and find the amounts from the summary table. If your tax authority allows you to deduct losses from investment income, please go to your overview page and download the list of investments. You will find the losses from the N column. Euro invoices are intermediated by Investly Holding OÜ, Estonian company nr 12710066. Pound invoices are intermediated by Investly Ltd, UK company nr 08966482. How is Investly different from other marketplace (P2P) lenders? First, we don’t charge investors (read more here). Second, we’re the most liquid marketplace lender in Estonia. Liquidity denotes the speed at which you can turn your investment into cash. The average invoice duration is just 31 days. With most other platforms, the investment duration is measured in years (even with the existence of a secondary market it takes time and effort to sell every loan). This means Investly is the best solution to increase the liquidity of your P2P portfolio. How are invoices different than business loans? When you invest in a business loan, your credit risk is with the small business that borrowed the funds. When you invest in an invoice, your credit risk is with the larger company that purchased goods or services from the smaller company. Small companies are much more affected by changes in business climate, a loss of customers, regulatory changes etc. All else being equal, larger companies have fewer issues with making a payment on time compared to smaller ones. Is Investly regulated by a financial authority? Invoice financing is not a regulated activity neither in UK or Estonia. Hence, the financing activity is not regulated. However, we have registered for AML/KYC compliance with the Financial Conduct Authority. Are there any provisions in place in case Investly ceases operations? We have partnerships in place with several collection agencies in Estonia and UK to continue debt collection should Investly cease operations.